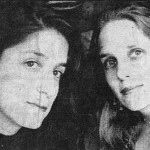 Lynne and Dana Sachs, two sisters from San Francisco by way of Tennessee, Connecticut, Rhode Island and other places, traveled to Vietnam in 1992 to look for the Vietnamese-American connection. 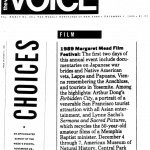 Lynne Sachs calls her latest film, Which Way is East?. 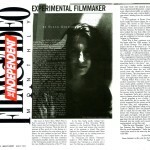 A “work-in-process.” She uses the phrase to describe those of her experimental documentaries that evolve over time. This particular one started as a road trip and flowered into a political discourse: It’s a half-hour travel diary of her trip to Vietnam – a collection of tourism, city life, culture clash, and historic inquiry that’s put together with the warmth of a quilt. 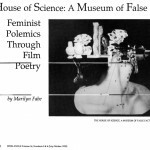 In The House of Science: A Museum of False Facts, Lynne Sachs exposes the edifice of scientific “facts” with which the male-dominated disciplines of science and medicine have constructed an image of what a woman is. Through-out the 30-minute film, Sachs traces the unfortunate inter-face between women and science, a terrain in which men are supposed to have all the knowledge, defining and mapping out women as their territory, while women are alienated from their own bodies.